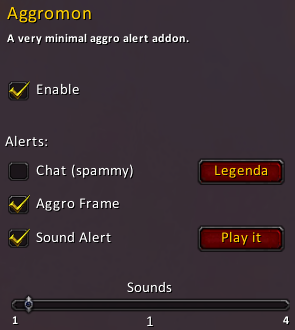 This is a very small aggro alert addon. I decided to wrote it mainly because I miss so much the little "AGGRO" sound of another addon "banzai-alert". The addon uses UNIT_THREAT_SITUATION_UPDATE to check for threat changes. It simply plays a sound and/or prints in the default chat frame and/or show a frame colored based on unit aggro (in combat). The options can be turned on/off indipendently each others. nil = unit is not on any other unit's threat table. 0 = not tanking anything. 1 = not tanking anything, but have higher threat than tank on at least one unit. 2 = insecurely tanking at least one unit, but not securely tanking anything. 3 = securely tanking at least one unit. - rewrite saved variables (now uses an array). - rewrite most of the code for the configuration panel. Now aggromon uses true/false instead 1/0 for variables to reflect the CheckButton:SetChecked() change. ... or simply delete [WoW Path]\WTF\Account\YOUR_ACCOUNT\SavedVariables\Aggromon.lua and restart with a fresh config. It is very strange it works quite well here without this error. Can you pls provide me the WTF/Account/Your_account/SavedVariables/gmAggroMon.lua . I tested while killing mobs. I can't reproduce the bug you told me ... if I use your gmAggroMon.lua everything works nicely. Have you tried to delete it when the game is off ? and then restart ? There was also a problem on curse. I have opened a ticket and they fix the downloaded file and version checking. You should download again from WOWI or from Curse (now that the problem is fixed). Last edited by gmarco : 02-04-17 at 01:08 AM. Last edited by Aisenfaire : 02-03-17 at 12:18 AM. Last edited by Flappers : 01-29-17 at 08:02 AM. so I start with a new config and everythings works like expected. The AggroFrame now appears only when you are in combat even if set it to show in the config. Now the position is saved. The aggro frame pop up only in combat. Stay tuned ... I'll post it asap I finished the modifications test. Thanks so much for creating this, love it. Just a couple of suggestions though if its ok. Can you stop the Aggro Frame from resetting to the middle of the screen on relog or reload of the UI ? Can you create an option to lock the Aggro Frame ? And finaly, would it be possable to create a rectangular frame simmlar to a DBM frame and make it possible to change colours and make invisable prior to any aggro ? Many thanks again, hope I'm not asking for to much. Hi thanks so much for writing. Uhm ... usually the frame should stay where you put and recover the positions next time you relog. Btw I have to check it because I usually use only the sound (aggro aggro and not the frame. As the custom frame think it should not so difficult calling the Hide() and Show() basing on aggro change. I'll check what I can do. Last edited by Flappers : 01-27-17 at 02:04 PM.